Don’t you love zippers for kids’ clothes? Easy on and off, no worrying about buttons that can pop off and find their way into a toddler’s mouth. And they’re easy to insert--honest! 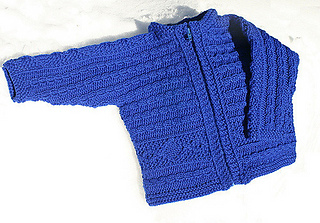 I did it for the first time when I knit the prototype for this pattern, now available for sizes 6 months to 6 years. 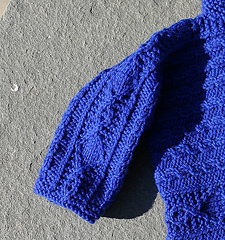 Above is a photo of the sleeve detail, “Mirror Cable” from Barbara Walker’s Charted Knitting Designs. The same accent cable encircles the sweater at the waist, as well as running vertically up the back. The pattern includes instructions for crossing the traveling stitches in “Mirror Cable” (and for working the baby cables) without using a cable needle. Although this sweater has a sporty apres-ski look, it also makes a perfect spring or fall outer layer; I used merino wool, but a cotton-wool light worsted-weight blend such as Brown Sheep’s Cotton Fleece would also work beautifully (just be sure to check gauge on a blocked swatch). Easy to intermediate. Skills used: twisted stitches, crossed stitches, three needle bindoff (for side seams), inserting zipper, reading charts. Pictured cardigan has a horizontal garter stitch hem; to simplify construction, the pattern instructions call for the hem to be worked along with the body, with the garter stitch rows running vertically on the finished garment; take a look at the front bands (turned 90 degrees) to get an idea of how this will look.